Our latest pattern is Hot off the Press! 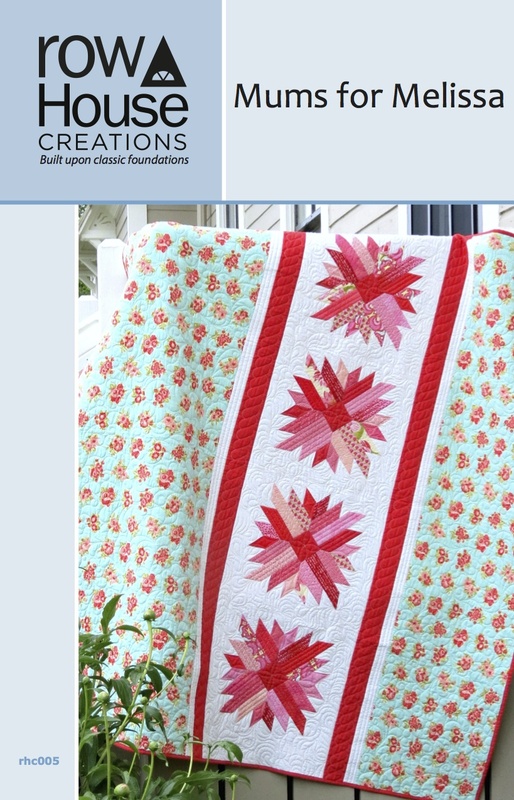 To read more about the making of this pattern and to purchase your copy, visit Row House Creations today! That is a beautiful quilt and really showcases the side fabric. You guys have done a fantastic job. The cherry blossom fabric from Violet Craft would be nice side fabric. What are the fabric requirements for the ‘mums? It uses 16 2″ strips (I know, we tried to make it work with 2 1/2″ strips, but it truly ruined the design of the quilt). The Violet Craft fabric would be gorgeous… your’e right! I made a Ghastlies version that I’ll share on the blog soon. It actually looks really cool despite the drab colors! Congratulations Row House Creations – another beauty! Thanks, Mary! This one is pretty special to both of us! Hope you’re travelling well and 2013 has been good to you so far. Congratulations on your article and your beautiful creation! I’m just popping in to let you know about a little #reverb-like blog challenge my friend Meredith and I are offering from August 21 to 31. It’s called August Moon and it looks all set to be magic! This is just stunning. Looking forward to the Ghasties version! !